The ISSA Interclean trade show will take place this year in Orlando 5-7 November. Pancomp will be there to introduce what is new in the mobile time and attendance solutions. Hope we see you in Orlando! Visit us at booth 3164! This year Pancomp will be exhibiting also in Sweden at the Clean & Facility show in Stockholm, 8-9 October. The Stockholm show is a great place for introducing the Pancomp Clean solutions to the Swedish and international markets on both Cleaning and Janitorial/Facility sectors. Visit us at booth C:25! The ASIS International 60th Annual Seminar and Exhibits (ASIS 2014) will be held in Atlanta, Georgia from September 29 October 2, 2014 where Pancomp will be presenting the newest features to the Secure Guard Tour smart phone app. Visit us at booth 4830! 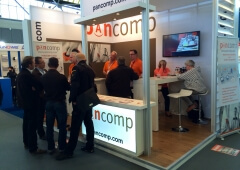 The biggest ISSA Interclean in its history is taking place 6.-9.5.2014 and Pancomp is exhibiting at the show. Pancomp is introducing its newest additions to the products at the show. The show organisers are promising the best show ever this year, as they are working to make the 25th birthday event festive. Visit the Pancomp stand 11.621 at the show to find out what is new in the field of time and attendance management! Pancomp International will be at the EuroShop 2014 trade show in Düsseldorf, Germany on 16.-20.2.2014. We will be introducing our newest additions to the Pancomp product family, the CSM Customer Satisfaction Measurement system in addition to the mobile application for time and attendance management. Come visit us on our stand in Hall 7, stand B23 for a demo. Pancomp is at the ISSA Interclean Las Vegas 19.-21. November 2013. Come visit us on our stand #760 for a demo of the new updates to our time and attendance products. Pancomp exhibition team wants to take the opportunity say thank you to everyone who visited our booth at CMS exhibition in Berlin. The event took place from September 24th to September 27th 2013. We had a lot of good discussions with companies wanting to make their service processes transparent, thus adding to efficiency and profitability. Pancomp Sales Director Mr. Jan Mäkelä states after the exhibition: The CMS event was a success for us. We wanted to talk to lot of people and gather quality leads. That is exactly what we did. We are also delighted to notice that Pancomp continues to provide solutions to cleaning companies which are highly valued by the industry. We look forward to welcome new companies in the Pancomp family who want to take the step towards more efficient cleaning services. See you again at the next CMS event in Berlin! Transparency, honesty and real time guard tour monitoring at PSG Turva Oy! One of Pancomp™s newest customers on the security sector, PSG Turva Oy, value transparency and honesty in their business, which is why they have chosen Pancomp as their system provider for guard tour monitoring. PSG had long been looking for an efficient and reliable system to provide their customers an opportunity to track the guard tours in real time, from their own offices. Whilst their old systems could provide reporting for the customer, this just was not enough for PSG as they wanted to be truly transparent and able to provide real time monitoring and reporting. Now, with Pancomp Secure, PSG can really live to their values of transparency and honesty. Read more about PSG Turva Oy. Pancomp International Ltd will be exhibiting at ISSA in Las Vegas during November 19-21 2013. The event will take place at Las Vegas Convention Center. The Pancomp team wishes you warmly welcome to discuss of how to make your service process transparent. If you want to set up a meeting with Pancomp, you may send a meeting request to sales (a) pancomp.com. Our Sales Director Mr. Jan Mäkelä will be in touch with you shortly after receiving the request. Pancomp is expanding! In search for new partners! Pancomp International Oy is expanding it’s operations on several markets, latest addition being dynamic Pancomp team in South Africa. Now we are looking for resellers in USA and UK for Pancomp Clean and Pancomp Secure solutions, in order to serve the growing demand on the target markets. If your company works within cleaning industry or security industry, and have a good contact base within our target segments, your company might be what we are looking for. For more information, contact our Sales Director Mr. Jan Mäkelä by mobile +358 40 7722 722 and/or by email jan.makela (a) pancomp.com.